DETROIT (AP) — Deborah Chenault Green is 62, a writer. But 50 years ago she was a pre-teen, sleeping on the porch to escape the oppressive heat, awakening to see a sky that glowed unnaturally. Azerine Jones is a retired baker. But in 1967 she was the 12-year-old daughter of a barber who watched his business go up in smoke. Girard Townsend is 66 now, living in a seniors building near the Detroit waterfront. But a half century ago, he was just a kid on a city bus. The bus stopped near 12th and Clairmount streets. Townsend stepped off — and into the very start of the Detroit riot. “I saw all these guys with masks and shields,” he said — city police officers, most of them white, far outnumbered by a seething black crowd. In the days that followed, he would witness — and take part in — an epic eruption of violence that still reverberates in his life and the life of this city. A decline that had already begun would accelerate; Detroit was the nation’s fourth biggest city in 1960, but would rank 21st by 2016. The middle class fled, and a proud city fell into poverty, crime and hopelessness. There are signs of rebirth in Detroit. But the men and women who lived through the riots are getting older, and most doubt they will live to see Detroit reclaim its former glory, when its very name was synonymous with American know-how and industry. “Detroit still hasn’t come back to where it was,” Townsend said sourly, sorting through 50 years of memories. Detroit wasn’t the first of the riots in the summer of 1967, and it was far from the last. Buffalo, New York, and Newark, New Jersey, preceded it; in the course of the summer, more than 150 cases of civil unrest erupted across the United States. Detroit’s started after a July 23 police raid on an illegal after-hours’ club — a “blind pig” — at 12th and Clairmount. The raid, though, was just the spark. Many in the community blamed frustrations blacks felt toward the mostly white police, and city policies that pushed families into aging and over-crowded neighborhoods. Townsend was among them. He made off with a television from a furniture store. There is general agreement that the rioters did not focus their fury on whites. Theresa Welsh and her husband, David, rented an apartment early that summer about eight blocks from where the riot started. “Nobody bothered us. We were a couple of white people wandering around,” said Welsh, 71. Deborah Chenault Green recalls she was at a cousin’s home. They slept on a mattress on the porch because it was such a hot night. National Guard tanks and other armored vehicles rumbled through the streets. There were reports of snipers firing on law enforcement, the National Guard and even firefighters from rooftops and other secreted spots. Authorities fired back. The city lost more than 2,000 shops to fires or looting, many of them owned by blacks. Among them was the barbershop on Warren Avenue owned by Azerine Jones’ father. When the smoke cleared and the military rolled out, Detroit stood bruised and battered. Jones said her father never rebuilt his barbershop. He took on other jobs after the riot. “Owning your own business as a black in the 1950s and ’60s was an accomplishment in itself,” she said. In the end, it was Detroiters hurting themselves, she said. The departure of white residents and businesses to the suburbs that had started years earlier accelerated. Between 1970 and 1980 more than 400,000 more people would leave. After the riot, David Welsh took a job as a photographer in a town just north of Detroit. He and his wife moved from the riot zone. The couple would move to other parts of the city and eventually settled north of the city limits. So did many middle-class blacks. 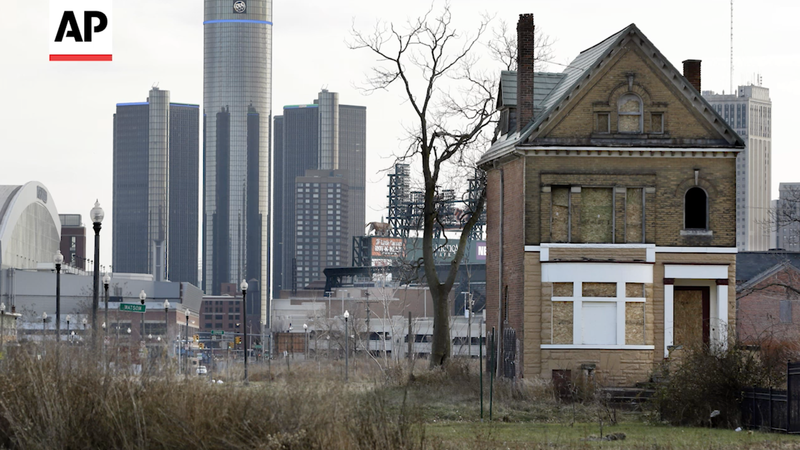 Altogether, Detroit’s population has fallen by about 1.1 million people since the 1950s. Even as the Motor City was diminished, Murder City grew. More than 700 homicides were committed in 1974. Within a decade of the riot, the car plants that provided jobs and helped keep the city running were hiring fewer people. Three years after the riot, Detroit’s unemployment rate was just over 7 percent. It reached 25 percent by 1990. Green was hired by Chrysler in 1978 to work on one of the automaker’s assembly lines. Today, nearly four in 10 Detroit residents live in poverty compared to about 15 percent nationally. The city’s $26,000 median income is less than half of the national figure. Now, two years out of insolvency and free of billions of dollars of debt, Detroit is working to fix up its battered neighborhoods and its image. Though more than twice the national number, unemployment is down to 11 percent. Downtown is thriving and some nearby neighborhoods are filling up. The city, 80 percent black, even elected Mike Duggan, Detroit’s first white mayor since the 1970s. The population is leveling out at around 670,000 people and families are taking advantage of special home buying programs through the city’s land bank. Between 2010 and 2014, the city’s white population grew from just under 76,000 residents to more than 88,000. To get there, Detroit has had to correct mistakes of the past that led to the 1967 riot and eventually bankruptcy. Duggan said many of those decisions were “rooted in racial discrimination” and included forcing poor black residents into ever smaller areas where housing stock already was aging or substandard. Loans backed by the federal government allowed whites to buy homes in the suburbs in the years leading up to 1967. But some who lived through the riots say any progress will not wipe away their distress in those five days of violence, and in the 50 years that followed. This story has been updated to correct the spelling of Girard Townsend’s first name.